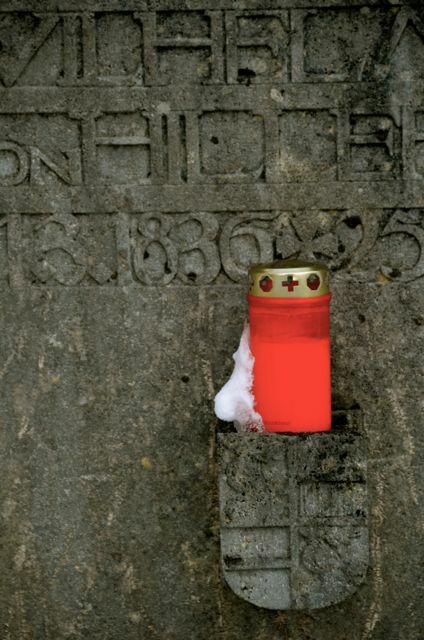 Perhaps it is a bit macabre, but I find cemeteries – particularly those in foreign locales – to be fascinating and fitting spots to reflect upon a place’s culture and history, and upon life itself. When my husband and I last visited Paris, we spent several hours strolling through the city’s famous Père Lachaise Cemetery, passing headstones of the famous such as Edith Piaf, Chopin, and Jim Morrison, and wondering about the lives of others buried there. Autumn leaves danced on the ground. The sun shone through the kaleidoscopic stained glass that adorned the windows and doorways of ornate mausoleums. Parisians on lunch break sought refuge from the hustle and bustle of the city by escaping within the cemetery’s peaceful walls; they sat on benches with books or lunch bags in hand. 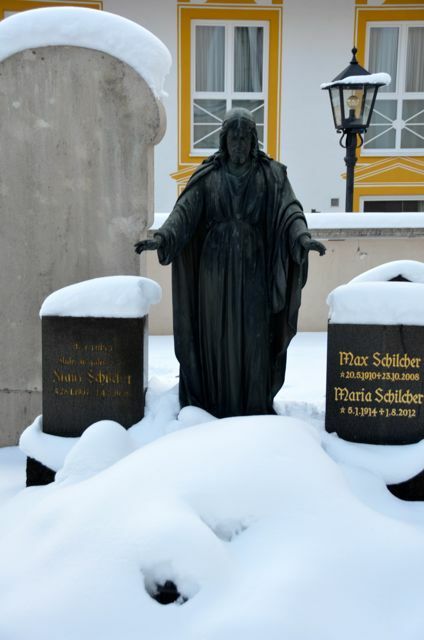 Just a few blocks from my parents’ home in Oberammergau, Germany is the St. Peter & Paul Church and Cemetery. The Rococo-style church that anchors the small cemetery was built from 1735-1749. Since the cemetery is just seconds’ away from the village’s center, we often pass it on the way home following an afternoon of errands. 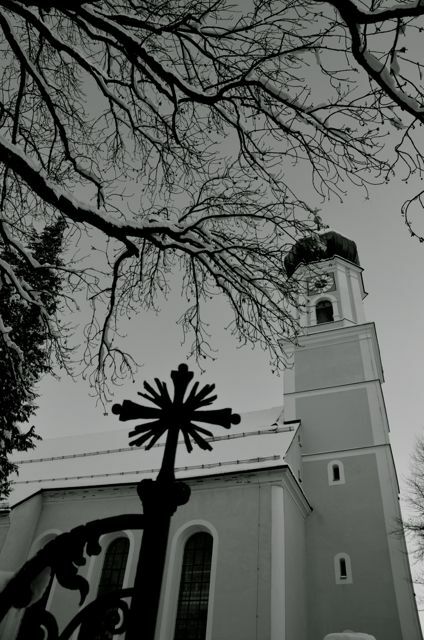 When we attended a picturesque Christmas Eve midnight mass service at the church, we saw young women, dressed in traditional Bavarian attire, placing candles at their loved ones’ graves. We learned that it is a tradition to do so here on Christmas Eve. On a recent snowy afternoon, we stepped through the cemetery’s ornate iron gate to glimpse the cemetery with a fresh dusting of snow. 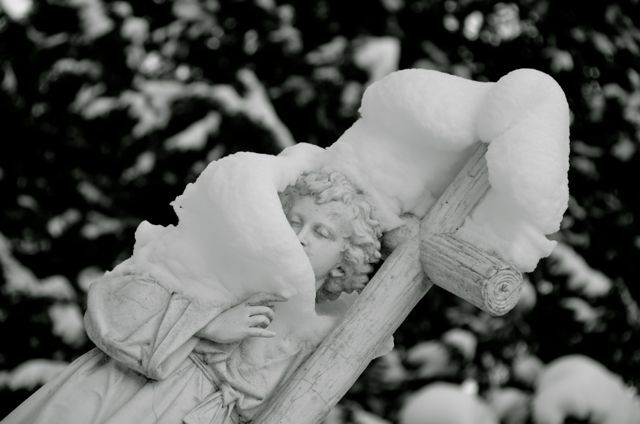 A stole-like whisp of snow appeared to cascade around one saintly figure’s neck. 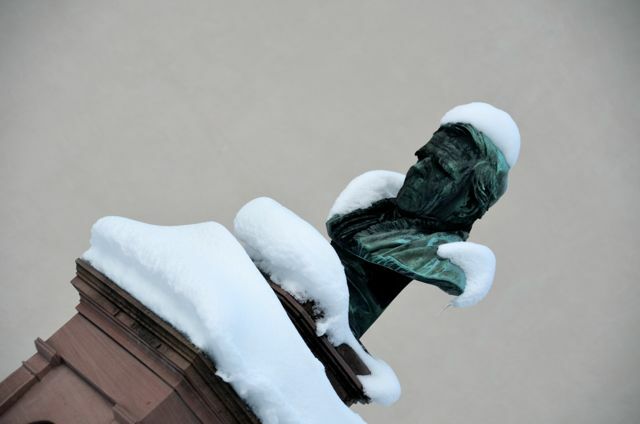 Some statues looked as though they had epaulets of snow on their shoulders. One bust seemed as though he had on a Napoleonic hat. Mother Nature’s recently-fallen, glistening winter accessory clung to iron crosses, gates, and the elegant skeleton-like branches of neighboring trees. 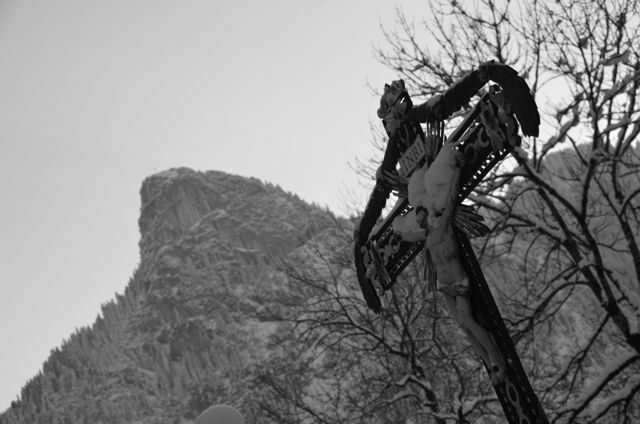 With the village’s signature mountain, the Kofel, overhead, I wondered about the lives of those buried there. Had their families lived in Oberammergau for centuries? Were they farmers or woodcarvers? What was life like for them during the World Wars? What were their dreams, their daily challenges, their personal stories? 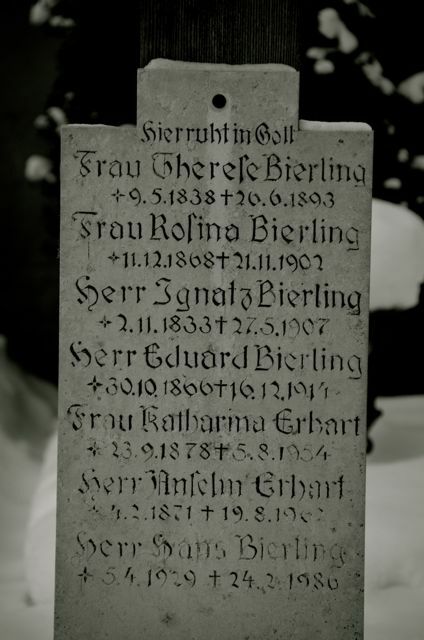 Some headstones were written in modern script, whereas others were etched in traditional Fraktur typeface. The dates spanned the 19th, 20th and 21st Centuries. As we left the stately, iron gates, we found that our Paris cemetery visit again came to mind – specifically our conclusion of the importance of making the hyphen in between the headstone’s two numbers the grandest of dashes. So glad you enjoyed the series, Renee. I’m pleased to receive such lovely feedback from you too. It’s hard to not be pensive in such a beautiful, peaceful place. We’ve just left Oberammergau (we’re in Croatia) but I do plan on injecting a few posts from Bavaria from time to time in the coming months. How is winter in the southwest treating you? Great series, extremely well done. Many thanks, Phil. With the headstones’ unique artistry, and the added element of the snow, it was a series that was really a joy to photograph. Great photos and post Tricia. Thank you, Mark. Fortunately, I was able to snap them rather quickly, for it was a bitter cold day! Wonderful. I find cemetreries always help put life’s things into a more proper perspective. I agree. In fact, seeing the headstones brings to mind an exercise Stephen Covey wrote about in his book, the 7 Habits of Highly Effective People. In it, he recommends planning one’s life with an end in sight… thinking about what one would like written on his or her tombstone, as well as the type of eulogy someone would like written. It’s quite a powerful exercise. Hope you have a splendid weekend, Alessandro. Tricia, I share your fascination with cemeteries. These are extraordinary photographs. 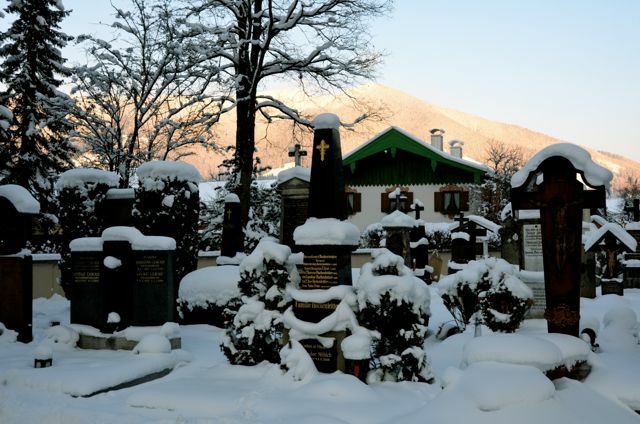 The juxtaposition of the snow against the grave stones – quite lovely. I’m not sure what the fascination is, but I can’t drive by a deserted prairie graveyard without stopping. I loved the ancient graveyards in Edinburgh. The tombstones embellished with scull and cross-bones and so thick with lichen moss you could barely make out the letters. Sadly, I never made it to Pere Lachaise in Paris. Next Time. Virginia, it took me several trips to Paris before I finally made it to Père Lachaise. Never made it to a cemetery while in Edinburgh, but your description of the lichen moss brings to mind images of Irish Celtic crosses in the springtime. Haunting. Wonderful post, Tricia. 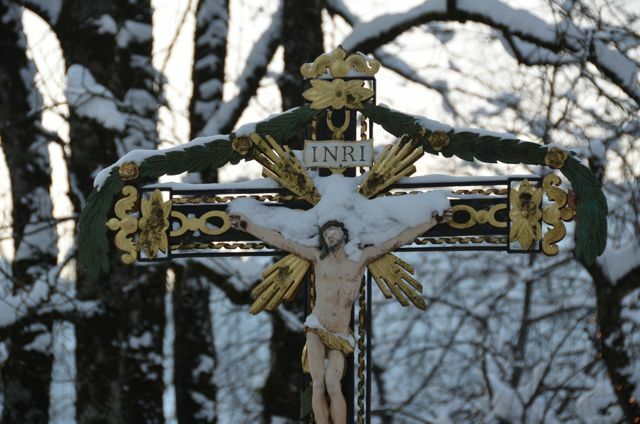 I haven’t been to Oberammergau since I was a kid (some 37 years ago) so this was especially interesting for me. That’s so much for sharing. Beautiful, Tricia, thank you for sharing.Love your post and your images. It is true that we put a candle on our lovd ones grave on christmas eve. When I was a child my father decorated a tiny christmas tree with ornaments and real little candles christmas eve we would go to my grandparents grave and light up the candles on that little tree.I always loved the long walk through the cemetary on the twilight atmosphere of christmas eve. Ibelieve that’s how I developed my interest to later on photography different cemetaries. A few years ago I flew to Paris, to spend an entire week exclusively only on cemetaries, My camera and Me. It was a wonderful experience. Later on I produced polaroid transfers from most of my images ( which were originally shot in slides and B&W) hoping I could make a book out of it. Cornelia, that’s interesting to hear how your childhood experience ultimately led to you developing an interest in photography! Your family’s tradition of putting a small tree (that had been so personally-decorated – even with candles!) on your grandparents’ graves is touching too. Are you still considering making a book out of your Paris images? And what has become of those classic images you mentioned several weeks ago? Are you still thinking about dusting them off and scanning them to share? How pretty. We enjoy looking through cemeteries too and reading the headstones. They often tell interesting stories. I don’t know that I would sit and eat my lunch in a cemetery though! I agree that it might feel a bit odd having lunch there, especially when there are so many wonderful Parisian parks through which to stroll. Are there any cemeteries that you’ve found particularly interesting during your travels? I’ve developed quite a fascination over cemeteries during my recent times of travels. 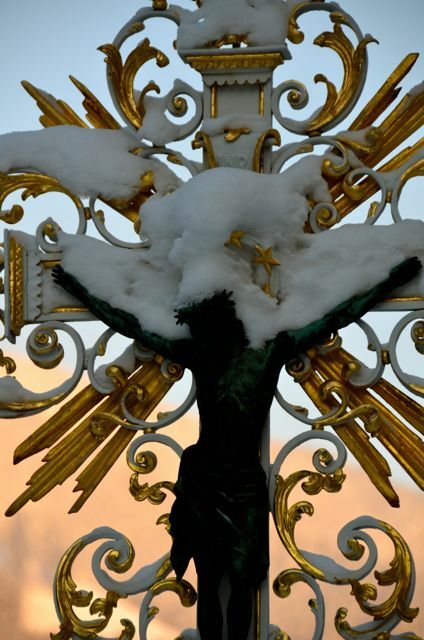 This one’s particularly beautiful because of the snow which adds a little dramatic flair to one’s visit. I’d be curious which ones you found particularly dramatic, Antoinette? I think Père Lachaise is one of the most scenic ones I’ve visited. Of course, every cemetery has its own unique flair. Tricia, this post is beautifully intriguing. 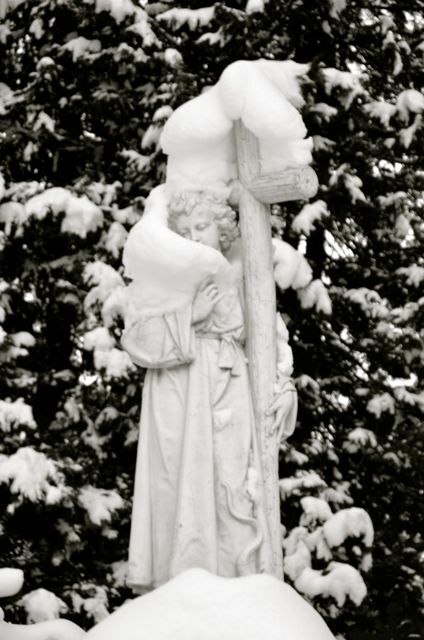 I love the uniqueness of headstones and with the snow, it brings so much feeling and emotion to the photos. Excellent writing and pictures!! Thank you, Judy. 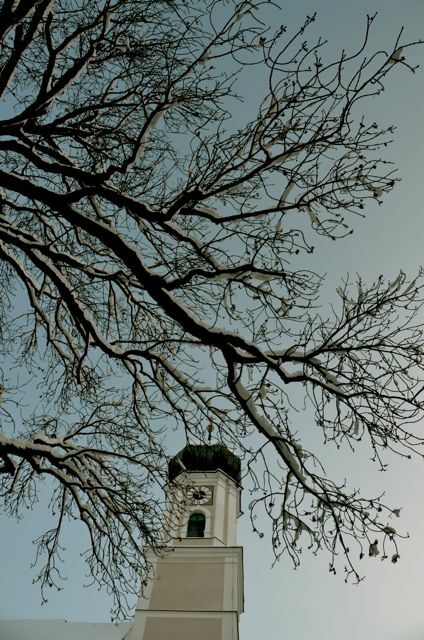 Snow does have a special way of highlighting a place’s best features. So wonderful photos. When shooting photos from churches, I always visit on cemeteries. What comes to Père Lachaise Cemetery, I have always said to all my friends that leaving Paris without visiting Père Lachaise Cemetery, You do not have seen Paris! I agree that it’s a quintessential component of a visit to Paris! Much history and many lessons to be found there. Thank you for this great article I just found. 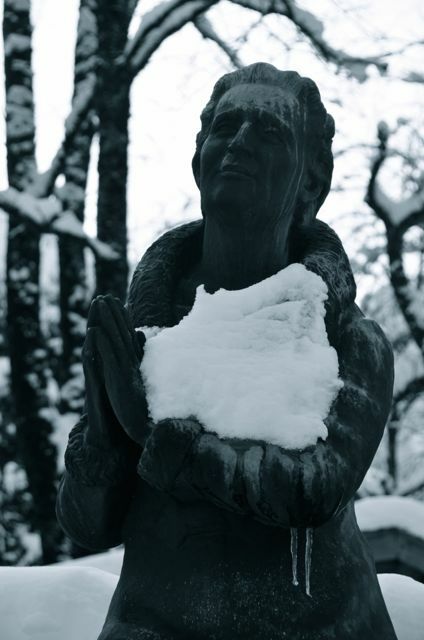 The praying lady statue is actually modelled by my great aunt and is on the grave of her mother, Marie Kronacher. Have pictures of ot but not from.this angle! Eluned, thanks so much for sharing your family’s connection to this statue. Such comments are one of the joys of blogging – hearing from others who are somehow connected to the tales I tell here. 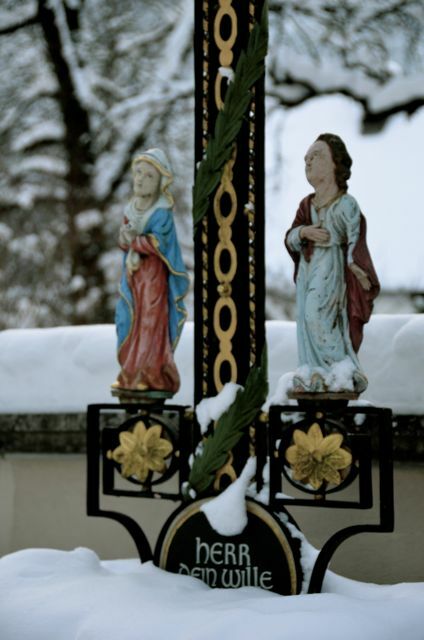 Do you still have family in Oberammergau? Eluned, sounds like you have some special ties to the village. 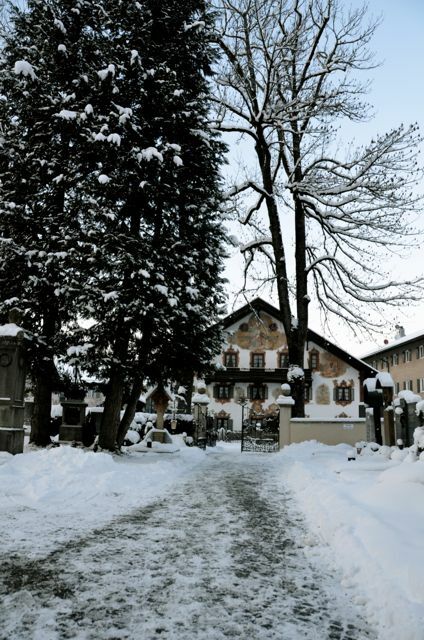 My husband and I have spent two Christmases in Oberammergau with my parents, and that setting perfectly epitomizes the Christmas season to me. When you visit, will you be staying in O-gau for a few nights, or commuting there from Munich or another town in Oberbayern? I will be traveling to Germany this winter for the first time during that season and I can’t wait see it and all the snow! looks amazing! Becca, Germany is beautiful dressed in snow, so I imagine you’ll enjoy your winter visit. Will you be visiting the mountains for some winter sports, or perhaps enjoying a mug of Glühwein at a Christmas market? I hopefully will be! I am a huge skier and hoping to hit up the mountains to get some beautiful skiing in! And I will try to be visiting as many Christmas markets as possible! I’m really excited! Sounds like you’ll be soaking up some of the best activities Germany has to offer in the winter months. We were married during the Christmas market season, and even stopped by the Heidelberg Christmas market for a few moments for our wedding shoot. It’s such a picturesque time of year to be in Germany! I hope you have a lovely time, Becca.